The Myers-Briggs Type Indicator (MBTI) is a well-recognized and widely used personality assessment instrument. The purpose of the MBTI is to make the psychological types described by C. G. Jung understandable and useful in people’s lives. As part of the Stay-Focused Leadership Development curriculum, we have used the MBTI with our mentors, to facilitate their understanding of their individual preferences, and to assist them in working effectively as part of a team. 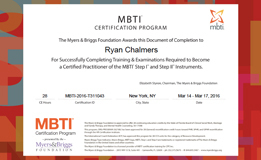 We are delighted Ryan Chalmers, one of our senior mentors, expressed interest in becoming certified as a Practitioner of the MBTI, and congratulate Ryan on successfully completing his training in New York City on March 17, 2016. Cayman Compass, Friday, February 18, 2016. 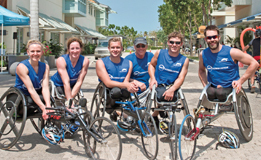 Many thanks to our good friends at Pinnacle Media for their ongoing sponsorship of our Push Across Cayman.